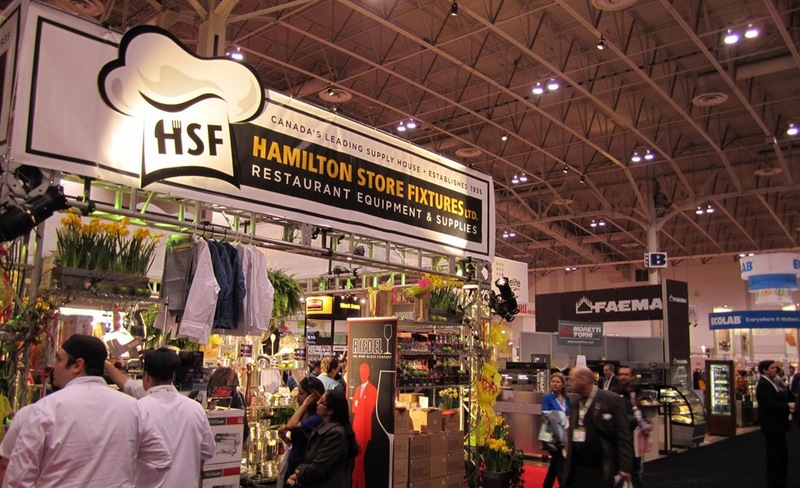 I recently attended the Canadian Restaurants and Foodservice Association Show held at the Direct Energy Centre in downtown Toronto. The purpose of the trip? Business. I currently work for Blue Link Associates, a software firm that specializes in the FoodService industry and we were there visiting current clients and trying to sniff out future clients as well. There was much to see and do and especially taste. One of the biggest draws of the show became abundantly clear early on: there was so much great food to try! The attendees were forming packs around the exhibitors with the best food. The cost of attending the show was only $25 so I highly encourage anyone who wants to try some great food to give it a try, especially if you have other reasons to be there as well (it was a popular show for culinary students, for example). After mingling amongst the great food for a little while though, it was off to work! A colleague of mine joined me at the show to aid in our intelligence gathering. We learned a couple things early on: pitching the idea of software at a food show is tough and some people don’t want to give out their information. And now for my “boo-hoo salesperson rant”. It is a shame that salespeople are looked down upon in today’s world. Salespeople were rarely ever given the time of day in the past, but as a result of the ever-growing spam and annoyances people face each and every day – legitimate marketing and sales have begun to be ignored even more. It has become harder and harder to get your message across so we must continue to find new ways to express ourselves to ensure we are heard. Spammers do what they do best; send out information to vast numbers of people with no targeting whatsoever. Over time these communications have been lumped in with legitimate marketing efforts and have driven the use of spam filters through the roof. There is now a lot of legitimate email (not even other marketing promotions) that are lost in these junk mail filters never to be read. What all this means is that we must be continually more targeted in our marketing and sales efforts. As I found at the show, the only way to breakthrough some of those barriers was to create a sense of familiarity. Discuss how you are relevant to their business, how you have clients in a similar industry (point them out) and talk about their business and what you can offer them specifically. Remain sincere and informative and focus on building a relationship and rapport. The solution for getting around spam filters I am still working on. I will report back when I have a solution. What other means to modern salespeople and marketers have to break through some of these defensive barriers? How can marketers reclaim their territory that spammers have all but taken? A colleague of mine also wrote a blog post on the Benefits of FoodService Software. Feel free to check it out as well. Previous postOverthrow Our Chinese Overlords? Very good! I didn’t realize that most of your clients were in food. I thought you only had a few. We have clients in many different industries but one of the most common is foodservice/food distribution. Sometimes we get free snacks at the office from our clients which is always awesome! I would be very interested to learn what it’s like trying to sell software in a very non-software based environment Dave. You bring up a great point about salespeople but the truth is, they are just so vital to an organization that it’s almost unfair really. Especially in b2b organizations. I await your report back when you have a solution around spamming.